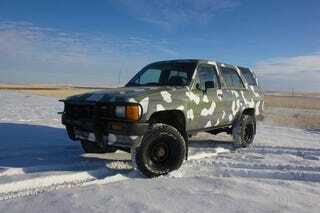 First generation 4runner with removable fiberglass top. 22RE EFI with 162K, 5 speed manual, 4x4, manual locking hubs, manual doors, no cruise, no electric mirrors, no sunroof, rear glass is working with zero issues. Partial trade for boomsticks (AKs ARs, Glocks, ammo, nice scopes etc) or bumper pull RV (28-30ft) only! -chain guides(steel), tensioners, chain and cam gear replaced at 144K with OEM parts, along with water pump and gaskets. -Alpine radio with Kenwood speakers in stock locations(no screws in metal hack-jobs) also small sub and amp. -Tires(on factory toyota rims) are just one season old. -nice seat covers and good rubber floor mats everywhere. If Toyota said to do it it was done, 22-24mpg normally. Drove to Oregon and back last September- no issues. NO LOW BALLERS or tire kickers, please don’t waste my time!!! Solid running truck. Clean, notarized and signed Montana title in hand. Cash only, NO payments, checks, PayPal etc!